I know it’s been several years in the making. I know we are almost at the eve of the biggest edition of the Lehigh/Lafayette Rivalry yet, the one in Yankee Stadium, the 150th meeting, the one I’ve been waiting for years to arrive. Yet it’s one play, one play, that I keep thinking about in the run-up to this game. I keep seeing that bubble screen in the 149th meeting of Lehigh and Lafayette, the one that put the game out of reach, the one that turned Lehigh’s bid for a championship last season become one that fell just short of a championship. There have been times this season that Lehigh has been agonizingly close to winning games they have ended up losing. It’s as if they’ve been stuck with bad karma; that they’ve been oh-so-close to winning, but some bad karmic event keeps them out of the victory column. 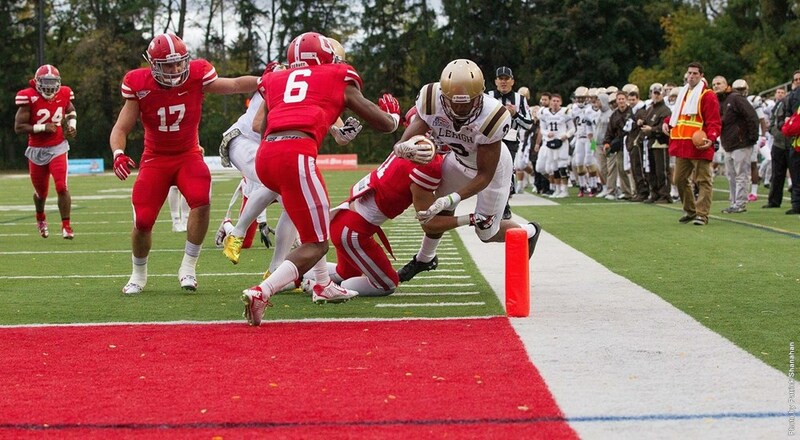 Against the Big Red on homecoming this weekend, the Bad Karma seemed to be at Schoellkopf Field for Lehigh once again. A well-defended pass bounced into the hands of Cornell WR Collin Shaw set up one Big Red touchdown. and a low snap to punter junior P Austin Devine set up another, making a 17-0 Mountain Hawk become a very slim, thin-feeling 17-14 spot for Lehigh. But then just like that, the Lehigh offense seemed to have finished with its bad karma, with senior RB Rich Sodeke leading the charge to set up one big touchdown, and scoring the final exclamation point on Lehigh’s first win of the season. It all added up to a satisfying return to winning for the Mountain Hawks. At the University of Alabama they call it “A-day,” and hold it in from of more than 76,000 fans. Head coach Andy Coen didn’t brand Lehigh’s spring scrimmage “L-day”, and, well, there weren’t exactly 76,000 fans who came to Murray Goodman Stadium on a beautiful sunny Saturday morning, either. Instead, though, the fans that came were treated to a pass-happy scrimmage that featured no tackling contact after the third series, thanks in part to the fact that Lehigh only suited eight linemen on the morning. It was a scrimmage that featured a whole lot of energy – and a whole lot of newness. Senior QB Matt McHale? Hurt. Got an injury that he’s rehabbing that has him ruled out of spring ball. Sophomore QB Nick Shafnisky? Just this week, he got tendonitis in his throwing shoulder, which limited his time this spring. Senior QB Gerard Poutier? Sorry, no. Still rehabbing a leg injury that he sustained last season. Suddenly, a former walk-on athlete had gotten most of the reps this spring at the most important position on the field. Senior QB Albert J. Visconti may not have been the guy that was hyped the most going into the spring, but the former walk-on now has the opportunity of a lifetime that’s every walk-on’s dream: a chance to be “the man” in the highlight of the spring football season. It’s hard being an offensive player at Lehigh, thanks to the shoes you have to fill. This season, though, at wideout and running back, it’s even more difficult than usual. At running back, all the incoming backs need to be able to do is outdo the accomplishments of RB Keith Sherman – who only was Lehigh’s first 1,000 yard rusher in the last eleven years, and also nearly carried last year’s team on his back to a Patriot League championship. And then there’s wide receiver, where the highest profile offensive players in the last two years, WR Ryan Spadola and WR Lee Kurfis, were back-to-back FCS All-Americans and broke a good portion of Lehigh’s receiving records. Kurfis, too, nearly carried Lehigh on his back to the playoffs last season. And Ryan is plyin his trade in the NFL, eager to break through onto the Dolphins’ roster once again. All the new group from this spring needs to do is to equal their level of excellence. Simple, right? You’d think with a headline like “Past and Present Lehigh Football Players Go Prematurely Bald” that the next sentence I’d be writing would be an ad for “Hair Club For Men”. Instead, though, I’m going to be writing about how a bunch of Lehigh football players going prematurely bald is a great, inspirational thing. This past Sunday, “Team Jack” went to nearby Phillipsburg, New Jersey, to get their heads shaved in solidarity with their favorite teammate and biggest fan, ten year old Jack Knudson, and also raise more than $2,000 for the St. Baldrick’s foundation for pediatric cancer research. 3 days until the season opener at Murray Goodman stadium! At no. 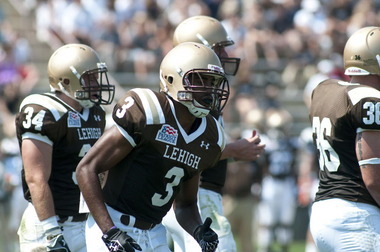 3, we look at junior WR Josh Parris as our highlighted Lehigh football athlete today.